Live Fado Show's take place at 7 pm, Monday to Saturday. There is no performance on Sundays. Performance's take place all year round. Book in advance during the peak season. We are comparing Best Live Fado Show in Lisbon: “Fado in Chiado” Prices from leading ticket suppliers and Try to find you Cheap tickets prices on the market. 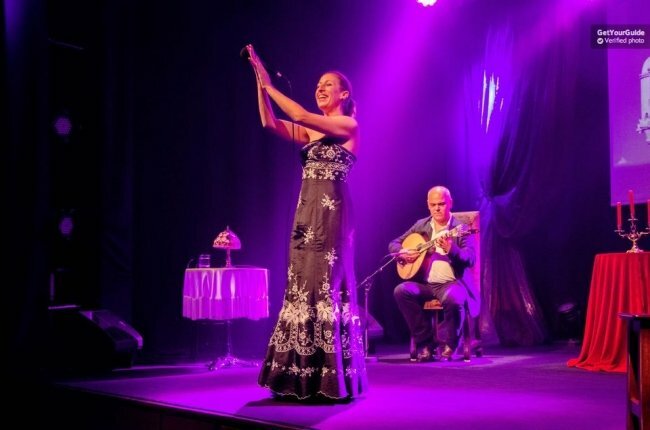 A Live Fado in Chiado performance is a must for anyone visiting the City of Lisbon, this ticket will get you access to one of the best shows in the Chiado Neighbourhood. An alternative experience to the standard evening out and far more intense than a large theatre show. In a small and unique local venue, even the toughest critic is sure to be moved by this soulful performance. Fado in Chiado is a show made up of a small group, just 2 talented singers and 2 equally talented guitarists, together the 3 artists will draw you into their deeply moving performance and take you on a journey into the heart and soul of Portuguese music. This popular Portuguese style of music developed in the early 1800's and quickly found it's way into the heart of Lisbon and the homes of the city's inhabitants. In 2011 the music style was accepted into UNESCO's collection on Intangible Cultural Heritage of Humanity. Although performances are in Portuguese the emotion expelled through the lyrics passes any language barrier. Fado songs are a complex, yet still beautiful, a combination of resignation and optimism, portraying both depression and longing. It's certainly a lot to fit into one 50 minute performance. An evening visit to one of Lisbon's Fado venues is a must for anyone looking to immerse themselves in a vital part of Portuguese Culture. We recommend the show for people who enjoy live performances in small venues and those like to learn traditional music and appreciate the soulful performance. The performance is suitable for all ages and can be enjoyed by both Portuguese and non-Portuguese speakers. Your Experience With Best Live Fado Show in Lisbon: “Fado in Chiado”? Get an insight into Portuguese music and culture at one of one of the best Live Fado in Chiado performances that Lisbon has to offer. Hear 50 minutes of beautiful Portuguese music performed by 4 experienced musicians. See another side of Lisbon in the Chiado Neighbourhood and learn about their traditional music. Enjoy an entertaining evening out in the city. What Best Live Fado Show in Lisbon: “Fado in Chiado” Includes? Live Fado in Chiado performance. Travelers Reviews about Best Live Fado Show in Lisbon: “Fado in Chiado”? The Best Fado Show in Lisbon receives mostly 4 or 5-star reviews on TripAdvisor, and most agree that it is a ‘must see' while in Lisbon. In particular reviews praise the talent of performers and comments mention that the length of the performance is perfect, particularly for children. Negative comments mention the venue's not having sloped seating meaning that children could not see well, try to arrive early or reserve tickets in advance to avoid this problem. Instant confirmation is sent vis email. Printed or Mobile vouchers are accepted at the dor. Tickets purchased from Tiqets are non refundable. Tickets purchased from Viator are fully refundable up to 7 days in advance and 50% refundable up to 3 days in advance. Tickets purchased from Get Your Guide are fully refundable up to 24 hours in advance. All children must be accompanied by an adult, children below the age of 6 can enter for free unless that are occupying their own seat, in which case the standard ticket price will apply. Please be at the venue at least 15 minutes in advance, late arrivals may not be permitted to enter. Entrance: 2nd floor, Rua da Misericordia, 14, Lisbon. The Theatre is located close to Paca Luis Camoes, easily accessible by both Blue and Green Metro Lines, or the 758 bus, disembark at Baixa Chiado station.